The purpose of the TACSAT-2 project was to rapidly deploy a low-cost satellite to explore the tactical utility of a space Intelligence, Surveillance, and Reconnaissance asset, which is a Department of Defense (DoD) objective spurred on by Operationally Responsive Space (ORS). The nature of this mission required a short schedule to prove the quick turnaround and launch capabilities of the Minotaur regarding the ORS mission for the U.S. military. When you consider the Minotaur/TACSAT-2 mission was accomplished in just seven months, from contract initiation to successful orbit insertion, you could definitely state mission accomplished. Europes small satellite makers are preparing to cash in on strong demand for their diminutive birds, both from traditional space-faring countries such as Franceand from smaller countries that are interested in owning space assets. The drivers for the expected growth are threefold: changing requirements, lower costs and shrinking electronics. Secure Satellite Telecommunications in a Nation-Building Environment, by Marc LeGare, CEO of Proactive Communications, Inc.
As a provider of military satellite communications, our companys focus is, understandably, on network security. Deploying and maintaining secure networks in war zones that keep classified information out of the hands of the enemy is critical for the effective execution of military operations. The secure satellite communications system PCI provides in Iraq has also had a significant impact on another, equally important arenanation building. On February 4th, 2008, the U.S. Air Force requested $11.9 billion from Congress for military space programs and satellites for fiscal year 2009. This request represents a slight increase compared to the $11.3 billion appropriated by Congress for fiscal year 2008.
thats a concise list of the importance of ground control for Command and Control (C&C). No matter how advanced the Milsat on orbit, without a highly viable and effect ground system for C&C, all you have is an orbiting, daily reminder of how much of the budget was reduced for the technically competent, but inaccessible, spacecraft. 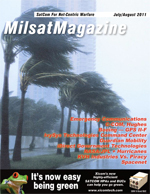 Sat Magazine was delighted to recently be able to chat with Jim Corry of Mobile Satellite Ventures, regarding his companys mutual aid radio talkgroups. Given the current state of affairs in our world, those with experience in the military aspect of our space and satellite capabilities are sought after by companies all over the world for their expertise. AMERICOM Government Services (AGS) has been highly involved with civilian and defense-related government agencies and their contractors since 1973. Executive Spotlight On... Richard Hitt..., CEO and President of Hypres, Inc.
Hypres is a leading developer of superconductor microelectronics technology and the Digital-RF product line. The company is currently developing an All Digital Receiver for satellite communications. During a recent conversation with Richard, he talked with SatMagazine about the companys live satellite demonstration, the All Digital Receiver family of prototypes, and where Hypres is targeting its efforts. On February 1st, 2008, the fishing vessel Spinning Dale ran aground on rocks in the remote Scottish archipelago of St. Kilda. With severe weather preventing the use of life rafts to evacuate the crew, helicopters were dispatched to the scene. If you have a desire to acquire the ultimate in information and gain access to the satcom industry, the best venue is the ISCe 2008 International Conference & Exhibition, sponsored by Hannover Fairs USA, Inc. The conference will be held at the San Diego Marriott Hotel & Marina in San Diego, California, June 10th through 12th. You may recall reading at SatNews about a new directive from the Department of Defense that seemed to indicate much of the U.S. Air Force�s control regarding GPS and Position, Navigation and Timing, had been removed. SatNews queried the authorities at the Global Positioning Systems Wing (GPSW) at Los Angeles Air Force Base, with the management of the project being at the Space and Missiles Center.